Right now One Fat Frog is holding a big sale on some of our used merchandise. One such item we’re blowing out is a countertop pizza oven by Baker’s Pride. This compact pizza oven is perfect for anyone who wants to cook pizza, pretzels, flat bread, bagels and such but doesn’t have the space for a full sized pizza oven. This baby is only 17 inches high and 26 inches wide, so you can find room in pretty much any kitchen, even if you’re just a little kiosk in the mall. In fact, this is the perfect oven for a pizza place or pretzel shop in the mall. This Baker’s Pride countertop pizza oven is 3600 watts and cooks in temperatures from 284 degrees to 680 degrees Fahrenheit. It has a single backing chamber with two stone decks. It is made of sturdy stainless steel and has a built-in timer, which is a must for multitasking chefs. If you need something a little bigger, One Fat Frog has you covered. 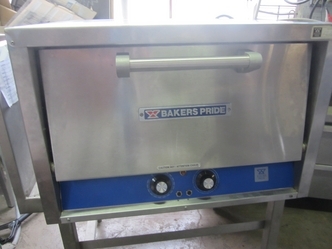 We also have a big discount price for the full size Baker’s Pride single-deck pizza oven. We’re selling this oven for the crazy low price of $1,900.00. 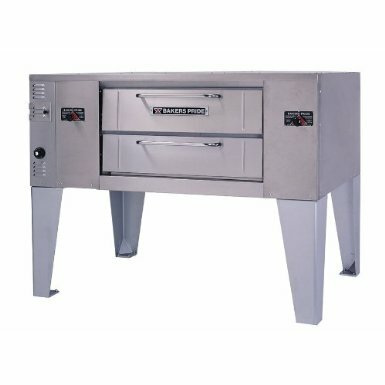 This is the 805 series pizza oven with a full size of 53 ¼ inches x 43 inches x 54 ¾ inches. It cooks at up to 60,000 BTU. Both of these pizza ovens are used and in great condition. Both are gas pizza ovens and both will go quickly at these prices, so you better call the Frog at 407-480-3409 or stop by our warehouse at 2416 Sand Lake Road in Orlando, FL right away.